People love to use their barbecue; They love food cooked on it; And they love barbecue tools, accessories and gadgets. There have been quite a few products invented for cleaning your grill and of course there’s the BBQ Grill Mat which you would use to keep your barbecue from getting grubby in the first place, so you don’t have to clean it. But in this post I’m going to take a look at a handful of BBQ items that you can use to clean your barbecue. Some of these have been around for a while and some are fairly new on the market. If you were looking for information on the barbecue grill mat then visit this page. Otherwise, read on. There’s another generalization about barbecues that is probably accurate: People hate cleaning them. So the question is, are there grill utensils out there that can simplify the process of grill cleaning? If you’re starting with a brand new grill you might want to consider using a barbecue grill mat so you don’t have to mess with cleanup. If you’re dealing with a grate that is already disgustingly filthy, here are some options. Everybody knows about the BBQ brush and its various permutations, so we don’t need to delve into that. There are a couple of precautionary notes on the use of it, however. The traditional BBQ brush has wire bristles, which can be harsh on porcelain-coated grates and will scratch and wear down the surface. Another problem with the BBQ grill brush is the occasional errant bristle. The wire bristles sometimes separate from the body of the brush, and if they happen to adhere to the barbecue grate, you stand a chance of ingesting one with your food, which would be nothing short of catastrophic. Consequently, I recommend wiping down the barbecue grate with a damp cloth if you’ve used a wire brush to clean it. If you’ve ever gotten a bristle from a BBQ grill brush caught in your throat then you know what I’m talking about – if you survived it, that is. If you’re not using a barbecue grill mat to keep your grill clean, there’s something you can use instead of the traditional bbq grill brush called Grill Floss. It’s a small metal scraper on the end of a handle. The scraper wraps around the grate bar and cleans it on both sides with minimum effort. This is an excellent tool. People are always coming up with fresh, original BBQ ideas, and it seems like every year there’s a handful of new BBQ tools showing up to solve some problem or other, to make things more fun, or just because someone got creative and adventurous. I don’t know of any innovative, new grill cleaning tool for the barbecue this year, but there are a couple of related BBQ gadgets you might not have heard about yet. There’s a wooden paddle, like the name implies, “The Woody Paddle” made from hardwood. 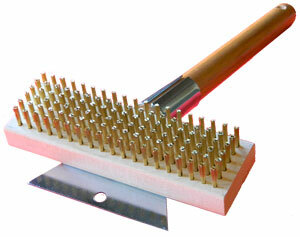 It certainly solves the problem of grate damage and bristles. 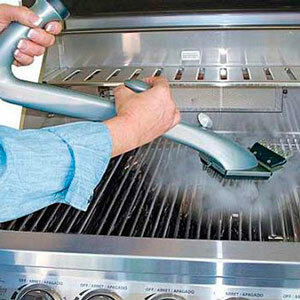 The more you engage it in the grill cleaning process, the better it adapts itself to your barbecue grill. This is because the wood wears down, and forms grooves with the exact dimensions of your barbecue grate. I don’t know if it requires any less work to use than the BBQ brush, but it looks like a really cool item. When it comes to non-toxic, ultra safe solutions, I think this product is up for status as the best grill cleaner. NOTE: The grillion seems to have gone out of business. I left it up here in case someone wants to create a new, sturdier version of it. If you’re wondering how to clean grill grates without scraping them with a hard tool, there’s also an answer to that. A fairly old trick that circulates in and out of style is to cut an onion in half and scrub the grill with it. The acids in the onion break down the grill residue and serve as an effective non-toxic barbecue grill cleaner. Someone took that concept to the next level with nifty idea that also has a great name, The Grillion. I’m not recommending it, as I’ve never used a Grillion nor actually seen one in real life, and the reviews are less than stellar. 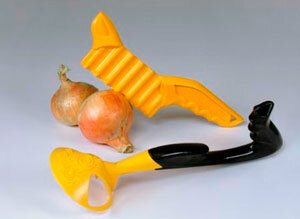 It’s a plastic item that includes a tool to cut the onion in half, as well as a holder for the onion. It theoretically handles much like a BBQ grill brush. Although it doesn’t appear to work very well, based on the reviews, I still think it’s one of the coolest BBQ gadgets to come along, and I hope they go back to the drawing boards and refine it. Use stainless steel construction next time, if I may make a suggestion. Plastic just isn’t serious enough to hold up to that level of use, and I think people would pay extra for a well made, expensive BBQ tool that carried that level of novelty. I would – stainless steel, perhaps. (In the meanwhile you could consider using a barbecue grill mat). Some people have had good results with a product called “Citrus Safe – BBQ Grid and Grill Cleaner.” The effectiveness of this product is directly related to how dirty the grill is, how old the dirt is, and the material the grates are constructed from. If you use it regularly, beginning with when your barbecue grill is brand new (like you would with a barbecue grill mat), I think it will do a great job of keeping your BBQ grill clean . If your grill is already filthy it might still work, and it is certainly worth a try. Obviously, there are stronger chemicals you can use, but do you really want to scrub your cooking surface with chemicals that kill lab rats? I think the best BBQ grill cleaner isn’t going to be something that robs you of your health. It’s not really worth it. So if you like the spray-on type cleaner for your barbecue, the Citrus Safe could be for you. There are a lot of different answers to that probing question of how to clean grill grates, and one of my favorites is the Grill Daddy Steam Grill Cleaner. I like BBQ gadgets and the more complicated they are, the better I like them. We’re back to the bristle brush on this one, but it cleverly uses the heat of the barbecue to produce steam from water – which the Grill Daddy feeds onto the barbecue grates. The steam is a nice addition to the brush concept, and it will definitely leave your grill cleaner than just using a BBQ grill brush. It looks like one of the more entertaining and rewarding BBQ tools for cleaning a grill, for sure. 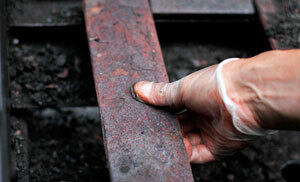 What if the best way to clean grill grates was not to clean them at all? Or more accurately to avoid getting them dirty in the first place? This is not so much a grill cleaning solution as it is a means of prevention. The BBQ grill mat is a rectangle of flexible nonstick PTFE fabric that you can place over the top of the grates and eliminate the need for grill cleaning altogether. They aren’t recommended for an extra-heavy load of meats that release a lot of grease, since you’ll probably end up with a grease fire in that situation, but they’re great for medium-duty meat grilling and they open up a host of other possibilities. And they are the slickest nonstick cookware to ever come along (pun intended). A barbecue grill mat will enable you to barbecue chopped veggies, fish, shrimp, bacon, hash browns, eggs, and pretty much anything else that you want. Cleaning a grill is never much fun, and with a barbecue grill mat you can eliminate the problem once and for all. The most well known of these is the Miracle Grill Mat, a famous As-Seen-On-TV grill mat which I review here, and which I do not recommend, which you will see if you follow the link and read about it. I recommend my own version because I set out to create the best one ever made, and what the heck, I’ll say it, I succeeded.